Isn’t this a great day? Look around you. Hard not to smile, isn’t it? As I take a moment and look around, my attention is quickly caught by our faculty. Nearly 40 members of the Pardee RAND Graduate School faculty processed with us this morning. I must admit, I’m a bit of a regalia buff. Some combination of the color, a vision of dons and students crossing the green lawns of Cambridge, all brought together with a bit of brass and a lot of ceremony ... stirs one’s heart! Thank you, faculty, for all you do for the school and specifically for the support of the graduates we are recognizing today. And over to my left ... it is good to see those who have done so much to build this institution. 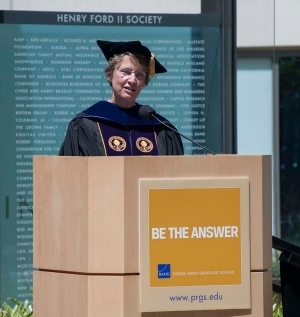 Founding Dean Charles Wolf and then-RAND President Harry Rowen — you had the audacity to imagine a Ph.D. program and graduate school housed not within the traditional confines of a university, but within the United States’ foremost independent research institution, the RAND Corporation. Charles, Harry ... thank you. Last night we celebrated the school’s history, and the legacy of these founders. Continue looking to my left and you can see many of those who are joining us in imagining the future of Pardee RAND, a future that I believe is as exciting as our establishment was 44 years ago. Joe Greer, our chair, and the members of our Board of Governors, Fred Pardee, and Michael Rich, RAND’s president. Michael has long seen the potential power of Pardee RAND. Michael realized that with the graduate school, RAND has the academic and intellectual freedom to think further, to think broader, to think bigger than is possible for any other research organization or “think tank.” The graduate school – with our students, faculty, and supporters – is an engine of innovation for RAND. Thank you, each of you — you are bringing our aspirations to life. Now, if I look a bit further around this “grand plaza,” I can’t help but notice a number of people who were grinning ear-to-ear with pride and affection as we processed. These are the people who have helped make this day possible for our graduates. Over here, I see the graduate school deans and staff who work with our students each day. These are the people who recruited them, helped them through organizational and academic hurdles, introduced them to RAND, and have offered support and guidance in countless ways these past few years. And, if we broaden our view, we can see our graduates’ husbands, wives, children, parents, brothers, and sisters, office mates, and friends who have encouraged our graduates throughout their lives, provided financial support, taken the kids to the playground one more time, read final papers and dissertation drafts, bought more than one beer, and offered the patient and unquestioning love and trust that is essential to completing a Ph.D.
Ah, and now to the most important people with us today. The men and women who are what this day is about – the newest graduates of the Pardee RAND Graduate School. Graduates, let’s pause for a minute. Each of you take a moment and think about what you’ve achieved. We’re not always so good at this, appreciating what’s been accomplished, even as we’re thinking about the opportunities of the future. Each of you plunged into this program, accepting a demanding and difficult challenge ... and you succeeded. As I look at each of you I think about the path you ventured down 4, 5, or ... okay, maybe a few more years ago for some of you! I think about many of you returning to academia after success in your professional lives – Jesse, you joined us from Planned Parenthood; Dan, a practicing physician; Lisa, from RAND Europe. I see our U.S. Air Force students, who joined Pardee RAND directly out of the Air Force Academy. We threw you back into the civilian world, took away your structure, and then asked you to complete your degree in three years! As students, you made tremendous and even groundbreaking contributions on RAND research projects. David, your work on Louisiana coastal restoration comes to mind. Todi, several studies on democratization and nations in transition. And I see graduates who looked beyond the theoretical to take on real-world policy problems in their dissertations. Amber offered insights on influences on flu vaccination uptake. Alessandro explored the value to students of for-profit colleges. Kay developed a new, and useful, measure of effectiveness of Defense Department labs. And Helen told us what is really going on in restaurant menus, even as they claim to encourage healthier eating. I’d also like to highlight students who, even with the academic and professional demands of this program, became true leaders in the Pardee RAND community. Students such as Caroline, with her leadership of the International Development Speaker Series; and Matt, who served on CoCom and as the student member of our Faculty Committee. We have much to do this morning and so I cannot talk about each of you individually, but let me be clear that we are often amazed by all that you do and all that you overcome during your time with us. But now, let me move to the real purpose of this Commencement. Commencements are about beginnings, about moving forward, about moving from a focus on learning to a focus on contributing. Congratulating you on your new degree but looking forward to what you will accomplish in your careers and in your lives. And here, I’ll ask you, our graduates, to look to those gathered for this ceremony. You do not need to look far to see examples of lives well-led. David Maxwell-Jolly and Mark Albrecht, who have been recognized with the graduate school’s Alumni Leadership Award. Those we are recognizing with honorary degrees today, RAND alumni Lloyd Shapley and Joan Petersilia, and Senator Elizabeth Dole and Los Angeles Police Chief Charlie Beck, as well as an earlier honorary degree recipient, Alain Enthoven. These exemplars — and many others in this audience and among your RAND colleagues and our alumni — have made remarkable contributions to our ability to provide healthcare to millions of people, enabled space exploration, brought analysis to national security decision-making, improved our support of prisoners re-entering society, and developed the “core theory” in game theory. These are people who have given their lives to bringing new understanding to the persistent and complex problems facing our nation and the world and to leading institutions essential to the fabric of our lives. I encourage you to reach out to those who are here with us, to be inspired their accomplishments and contributions – and yet, to not be limited by them. This morning, we are here not only to congratulate you, but because of our hope in, our belief in your future. Build on this foundation of support and love, and fulfill the commitment that brought you to here. Take the tools, experience, and education you’ve gained at the Pardee RAND Graduate School, and combine them with your talent, intelligence, and heart to make a difference, to make the world a better place, to be the answer. As we move forward with our Commencement, let’s each of us make the most of this day of accomplishment and promise. Turn to those around you, walk over to those across the way, learn about what they’ve done to make a difference, and strengthen your own commitment to doing the same. Thank you, and enjoy the day!